Ted Lindsay shakes the hand of Tracey Cohen after announcing a donation of $1 million to Oakland University for autism services for adults and teens. Cohen has autism and is employed as a social group facilitator at OU. In retirement, the 93-year-old Hockey Hall-of-Famer is remembered not only for his on-ice toughness but for his softhearted dedication to helping children with autism through his charitable foundation. He was known on the ice as Terrible Ted, the scrappy left wing whose aggressive play on the legendary Production Line helped lead the Detroit Red Wings to Stanley Cup Championships in 1950, 1952, 1954 and 1955. 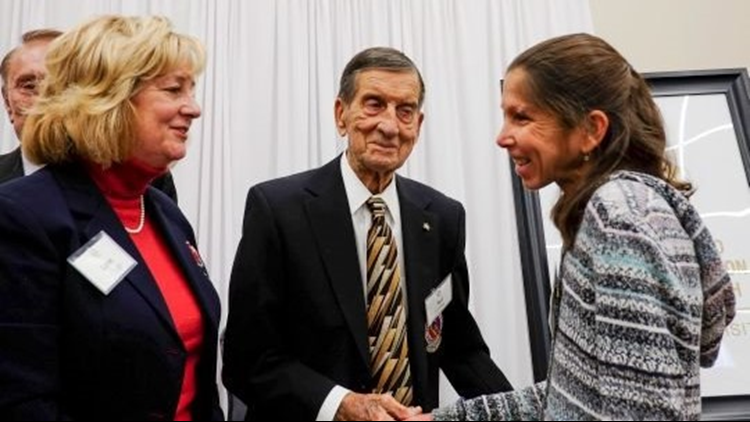 More than six decades later, Ted Lindsay has a different nickname, Terrific Ted, "because of what he does from a humanitarian standpoint," says his son-in-law Lew LePaugh, who also is president of the Ted Lindsay Foundation. The foundation announced last week a $1-million donation to Oakland University's Center for Autism Outreach Services, or OUCARES, for programs for teens and young adults with autism. "If nothing else, that’s probably his legacy more than anything. He didn’t have to do it, but he has always believed in doing it," LePaugh says. Lindsay laughs when he's asked what he'd most like his legacy to be. "I’m still alive," he says. "My legacy? I never worried about it." A few seconds later he adds: "Be good to people." The fans, he says, were always good to him. "When I made the Detroit Red Wings, I could have gone to Toronto," says Lindsay, who grew up in Kirkland Lake, Ontario, and played junior hockey for the St. Michael’s Majors in Toronto when he was drafted in 1944. "I could have gone to Boston, to New York, but I couldn’t have chosen a better place than the Detroit Red Wings. Great hockey town. Great hockey people. They have been very good to me." So he is trying to return the kindness, donating $3.4 million toward autism-related causes since the foundation was created. Its latest gift to Oakland University will go into an endowment so it can continue to benefit students for years, says Kristin Rohrbeck, OUCARES director. The money will be used to expand its recreational sports, social skills programs, employment readiness training, summer camps, independent skills, and life skills training for teens and young adults with autism spectrum disorder. "A few of the things that we are going to be looking to do first is to offer scholarships to teens and adults as well as families, and boost the quality of our programming by employing an applied behavior analyst ... to teach employment readiness, life skills and social skills as well," she says. The program also will change its name to the Joanne and Ted Lindsay Foundation Autism Outreach Services. Lindsay's interest in autism was sparked nearly two decades ago, when he was working out with John Czarnecki, his physical therapist and trainer. "The trainer had a young boy at the time. ... He mentioned to Ted that his kid was just diagnosed with autism," LePaugh says. "Well, 18 years ago, we didn’t really know what autism was. Ted and Joanne looked it up in their dictionary and found out. "Well, the next time he worked with the trainer, he said, 'We’d like to help Dominic. What can we do?' Because he knew the medical costs, and what have you, are pretty rough on a family." The Lindsays started the foundation with money from a charity golf outing. Over the years, it contributed $1 million to Beaumont Children's Hospital for the Ted Lindsay Foundation HOPE Center, and also has supported the Miracle League of Plymouth, Autism Speaks-Jackie’s World, the Macomb-Oakland Regional Center, the FAR Therapeutic Arts and Recreation programs and Dutton Farm, among others. "His philosophy is that it’s not about him," LePaugh says. "It’s about helping others. He’s grateful for his fan base. He doesn’t go around life thinking about himself. His legacy is that he was a Red Wing. He came to Detroit as a Red Wing and left as a Red Wing, from a hockey standpoint. "He has taken some of these young professionals that are coming up in the team now and is teaching them and telling them the same thing: You have to give back to the community. The fans pay for your tickets. They’re your real boss." Red Wings center Dylan Larkin, a 22-year-old Waterford native, has joined the foundation as a director, LePaugh says. "Dylan knows and respects Ted and even as a young kid, he knows his history and what he did for the players … with the players association. And (former Wings defenseman) Joey Kocur joined us about a year ago also to help us out. It’s designed so that the foundation continues on in the future," LePaugh says. Even though Lindsay has stopped skating and working out in the weight room, he says he's still healthy. He had major heart surgery to replace an aortic valve five years ago, but bounced back quickly. "I am talking to you just a couple years later, so I’m pretty good," says Lindsay, who lives in Oakland Township. "I feel good. I have no problems with sleeping at night. And so I should last quite a bit longer, I hope." Long known as a fighter for players' rights, Lindsay says the game has changed since his days in the NHL. He understands why the league has instituted new protocols to protect players from head injuries. "There’s a lot of reasons for things like that," he says. "Guys are getting bigger and men are stronger," Lindsay says. "They carry their sticks a little higher." Lindsay, who spent a cumulative 30 games in the penalty box during his 17-season NHL career, says he doesn't know whether he ever had a concussion when he played, but says "my mind is working fine today and my health is still fine. "I was born with a tough skull. I never wore a helmet and never will wear a helmet." If players just kept their sticks on the ice, it could solve a lot of problems, says Lindsay, who estimates he had about 700 stitches in the course of his career. "Keep your stick on the ice. That’s where the puck is. You don’t have your stick up high. Keep your stick on the ice. The name of the game is put the puck in the net," he says. LePaugh chuckles as he talks about Lindsay's reputation as an aggressive player. During his days skating at Detroit's Olympia Stadium, "he was probably more prevalent in giving concussions than receiving them," LePaugh says. Lindsay coached the Wings at Joe Louis Arena and has visited Little Caesars Arena, too. Though he has never skated there, he says of the new arena: "Ice is ice. Once you get used to the rink, it’s all the same." LePaugh remembers going with Lindsay to LCA when it first opened. "He thought it was way too much," LePaugh recalls. "When he met some of the players down in their locker room kitchen area, they said, 'Ted, what do you think?' He looked 'em straight in the eyes, and he said, 'How many goals are you going to score to deserve this?' Because it’s all about goals, and he thinks it’s over the top. "Not understanding the political arena in hockey today, you have got to have something to attract these players. But to him, a sheet of ice, that’s all you need." Lindsay wouldn't comment on who the best player in hockey is today, saying he doesn't feel qualified to judge. But he does know this: "Hockey is my No. 1 love in terms of recreation. It was made for me."